The Cox Conserves Program honors and celebrates environmental volunteers across the country. Neil is one of three Cox Conserves Heroes finalists in the greater Boston region. If he gets more votes than the other two finalists, the PLIA will be awarded an additional $5,000! Pawtuckaway Lake is the location of a State Park offering camping, hiking, swimming, and fishing for visitors and residents alike. Keeping it clean and free of invasive weeds benefits all who enjoy its natural beauty, and that is one of the primary goals of the PLIA. It’s what Neil and his snorkel patrol devote hundreds of hours to doing. Please help us boost the PLIA’s grant from $5,000 to $10,000 by voting for Neil NOW. Just go here, click on the VOTE button under Neil’s picture, and fill out the information for your vote. Voting ends September 25th. Pawtuckaway Lake thanks you! 2 Comments on Vote for PLIA Volunteer Neil Santos! 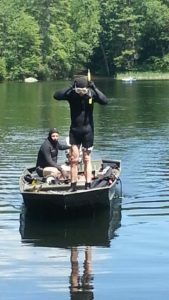 Divers from NH Department of Environmental Services were at the lake Friday morning to remove the milfoil that had been marked by Neil’s team. While they did remove milfoil that was found, the divers discovered that many of the very small plants, which were thought to be milfoil regrowth areas, were actually coontail, a native plant. Those who have reported seeing such plants in the lake and have wondered if they were milfoil will appreciate how similar the two plants look. There was also one marker that had somehow been moved over the past week which Neil relocated using GPS, but the divers could not find that milfoil. This was one small plant which will need to be located again by snorkeling. In addition to checking the marked areas, the DES divers did a general sweep of the mid-channel area between the markers but did not find any additional milfoil, so we know there is at least one small plant in the channel. It is also a fair probability that there are other small milfoil plants as well that haven’t yet been found. It is important to note that the divers have removed less and less milfoil on each visit over the past two years. It is hoped, therefore, that containment, and possibly even elimination, look promising as long as careful monitoring of the channel area can be continued for at least the next couple of years. It also goes without saying that our Lake Host program is a crucial tool in minimizing the probability of re-infestation! A heartfelt thanks to the tireless efforts of Neil’s Weed Watcher snorkel patrol and our vigilant Lake Hosts! On July 9, 2017, PLIA volunteer Neil Santos and his team of Weed Watcher snorkelers and divers traveled up to the boat launch in Fundy to search for milfoil. They started at the launch and snorkeled their way down the stream about 2/3 of the way to the black marker where the stream opens up. The visibility was extremely poor. Close to the launch there was considerable sediment in the water due to the boat traffic/ launches but even downstream the amount of tannin in the water made it difficult for sunlight to penetrate and kept the visibility to 2-3 feet at best. Fortunately, Fundy is quite shallow and, even though they could not see very well, they had good confidence that they would have spotted any significant patches of milfoil. They saw a good deal of bladderwort, native milfoil, and grasses but were happy to report that they did not see any invasive milfoil. Thanks to diligent boaters and especially to the Lake Hosts! On the following weekend, July 15, 2017, the team convened in the South Channel and searched Area 3, where they discovered a number of patches of milfoil in the mid-channel area. Each patch contained a handful of plants. They were all in the area where milfoil was discovered last year so it is undoubtedly regrowth. The “relatively” good news was that the plants were all comparatively small,–about 6 inches to 2 feet tall–and therefore well out of harm’s way of prop contact and prop wash. They also surveyed the area to the southwest of the mid-channel where they had found a couple of plants last year but that area appeared to be clear. They left a few markers in the channel but there are more patches than are indicated by the floats. They plan to put out additional markers to guide the divers closer to the time when they will be here to pull what was found. The DES divers will be here during the week of July 24-28. Let’s hear it for the Weed Watcher snorkeler team! Of course exuberance is always a part of this celebration, and we encourage it! But please, no water balloons!!! Super soakers are a great way to express your enthusiasm without endangering the health of the lake and our wildlife. So, haul those decorations, flags, and banners out of storage, and see how colorful you can make your watercraft this year. Anyone one who captures pictures of the holiday fun at the Boat Parade this year is invited to submit them to: Info@PawtuckawayLake.com. We are always looking for photos of events on the lake to add to our gallery. And as always – see you on the lake! An anonymous Pawtuckaway fan recently sent this poem to the PLIA. 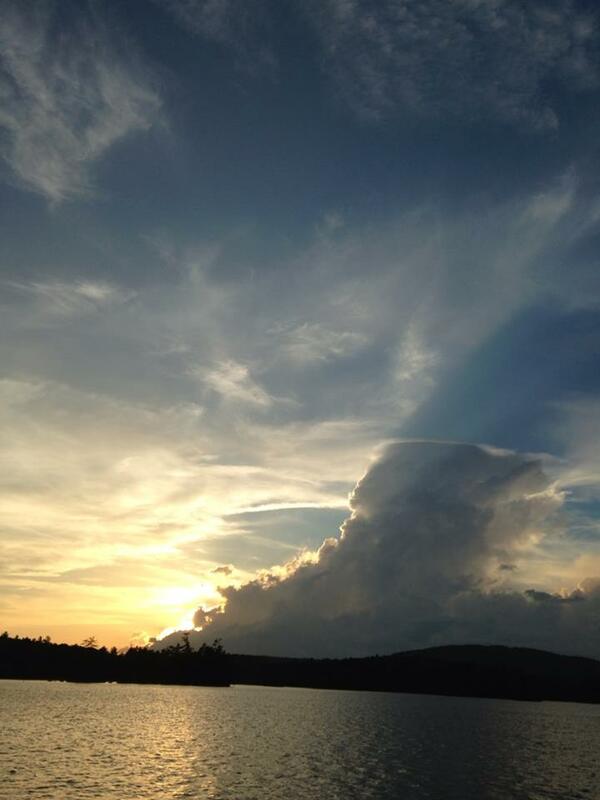 It is untitled, but we think it captures Pawtuckaway Lake in summer, and we would love to know who composed it. Many thanks! It’s a brand new day at Pawtuckaway. The mist is no more. Pay attention! It’s in sight and sound. I love this place; Pawtuckaway! Once again a loon sings its lullaby. Because it seems that way. 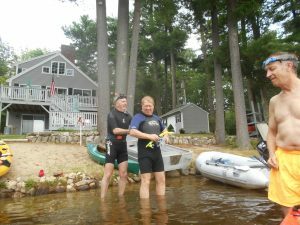 Our Milfoil Search Team started its summer activities on Pawtuckaway Lake on June 1. So far PLIA volunteers John Hudson, Jim Kelly, and Neil Santos have conducted three snorkeling sessions in the area near the State Park Horse Island boat launch in the South Channel. 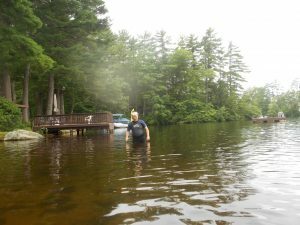 They have found several small milfoil plants that were marked for removal by NH DES divers on June 9. 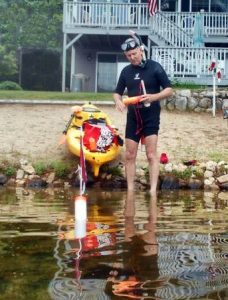 A larger milfoil plant in the area of the red and white buoy was found by the certified scuba-diving relative of a lake resident, but subsequent attempts to locate it again have not been successful. This effort, and underwater searching in general, has been hampered by the murky conditions due to the amount of pollen suspended in the water. Underwater visibility has been less than 4 feet, but should improve in the next few weeks as the pollen settles to the bottom. The Search Team should then be able to get a better assessment of the overall milfoil situation in the South Channel. 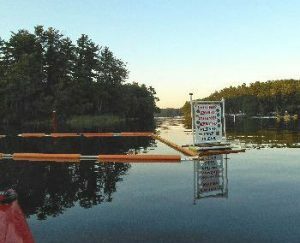 Their activities in the South Channel will continue throughout the summer and NH DES divers will return periodically to remove any milfoil plants that are found. Several additional snorkelers and scuba divers have expressed an interest in helping with these efforts and more assistance is always welcome. We ask all boaters to please stay well clear of any orange milfoil markers in the South Channel and, for the safety of our Milfoil Search Team, stay at least 100 feet away from any “Diver Down” flags that you see anywhere in the lake. Do you know what this flag means? Have you seen one on the lake? 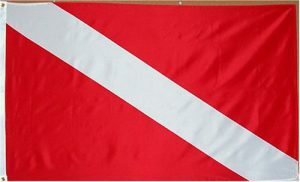 If you do, this is the Diver-Down flag. It means that a diver or snorkeler is within 75 feet of their flag. 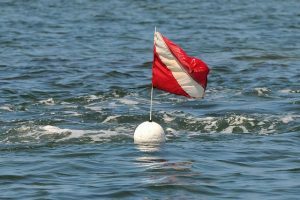 It also means that ALL boats/vessels must stay at least 150 feet from a displayed Diver-Down flag per NH State law. Frequently there are divers and snorkelers in South Channel searching for milfoil plants, to identify any plants that may have taken root and mark them for removal. For the safety of these divers and snorkelers who volunteer their time for the benefit of the lake, we ask that you respect this flag, keep your distance, and reduce your speed. Please remember that South Channel is a no wake zone and speeds should be kept down at all times, anyway. There are markers at both ends of the channel as reminders. And please spread the word! 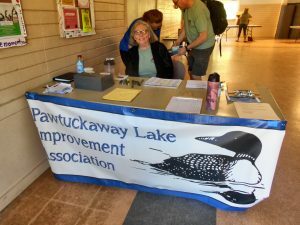 In a new location and on an earlier date, the Annual Meeting of the Pawtuckaway Lake Improvement Association was well attended this year, with about 70 participants. President John Decker presided over the business meeting, in which a new Board member, Susan Hayes, was elected and five other Board members whose terms were expiring were elected for another two years. The Board of Directors’ proposal to amend the Bylaws in order to change the membership year from June 1 – May 31 to January 1 – December 31 was also approved unanimously. Treasurer Ed Kotowski presented the year-end Financial Report and Dee Decker gave the Membership Report, explaining that less than half the households on and around the lake are members and urging those present to encourage neighbors and friends to join the PLIA. John Decker summarized the milfoil situation to date and all the efforts last year to locate, prevent the spread, and remove it from the South Channel. Boaters who avoided the South Channel last season were commended for their cooperation. Milfoil was not detected as of last fall, but it is a stubborn adversary and may reappear this year. Weed Watcher Neil Santos described the work of his snorkel team to regularly patrol the South Channel searching for and marking any new growths for removal by the DES divers. Vice President Tom Duffy invited anyone who is a PADI certified diver to join Neil’s team in locating (but not removing!) milfoil. Divers with open water certification may take the milfoil removal training offered by the State, with the possibility of scheduling a locally conducted course. In response to a question from a member about closing the South Channel to boat traffic, John Decker advised that we don’t have the authority to take such action and the State has not determined that the infestation is severe or widespread enough for such a measure. Lake Host Coordinator Dee Decker reported on the activities of that Program last year and summarized the changes coming this year. A “Pull Your Plug” theme will be emphasized in the new campaign of Clean, Drain, and Dry your boating equipment. The State is very invested in this Program and a valuable partner in our efforts to prevent and control invasive species in Pawtuckaway. A new law was passed in NH that prohibits the transport of invasive species—whether knowingly or not—on boating equipment, and which carries fines and penalties. Weed Watcher Co-Chair Steve Soreff urged members to keep their eyes open for invasive weeds whenever they are out on the lake. He reminded members that it was one of our Weed Watchers who initially detected the first growths of milfoil in 2015. John Decker announced the development of a PLIA Facebook group for members only. Look for coming announcements! He reminded everyone present to be good lake stewards, help clean up debris, and avoid water balloons on the lake. Give a hoot; don’t pollute. 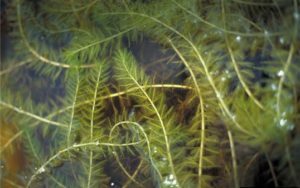 Tom Duffy conducted a Milfoil Challenge to test the knowledge of PLIA members, and was pleasantly surprised that most knew a lot about this invasive weed and how best to control it. Everyone deserved a prize! Following the business portion of the meeting, members broke into small discussion groups led by Paul Miliotis (winged wildlife on Pawtuckaway), Tom Duffy (developing your property—Shoreland Protection truth and fiction), Dee Decker (Clean, Drain, Dry and the Lake Host Program), and Steve Soreff (history of Pawtuckaway Lake and the State Park). YOU ARE ESSENTIAL TO WHAT WE DO! This past year was a busy one for the PLIA. Of utmost importance was to step up the fight against the milfoil growing in South Channel. We were optimistic that the divers from NH Department of Environmental Services (NHDES) were able to eradicate it in the fall of 2015. Unfortunately, there were still roots that survived the winter and grew during the summer along with fragments creating new areas of growth. 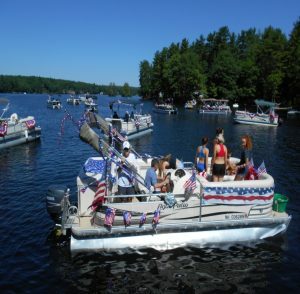 Everything came to a head as we approached the 4th of July weekend with the Board making the hard decision to split the 4th of July boat parade in two to avoid going through the South Channel. With input from the State, signs were posted at each end of the channel and the State Park staff spoke with each camper as they registered asking that boaters avoid going through the channel. Marine Patrol also put up No Wake buoys and indicated that they would step up patrols in that area. I would like to thank all who avoided South Channel through our time of crisis. The reduced traffic helped prevent the fragile plant from breaking off and rooting in other spots. 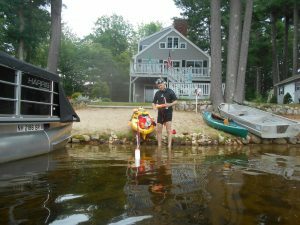 Thanks to volunteer Weed Watcher Neil Santos and his band of snorkel divers, South Channel was patrolled frequently for milfoil growth and marked with orange buoys. Specially trained NHDES divers would come and pull the latest growth; at points this summer this was about every two weeks. Just as we were finishing up the season we received news that no plants were observed and the signage was removed from South Channel. While I’m hopeful that we have eliminated the plants and will continue to hear of no findings from our divers, milfoil is very resilient and it is likely to be back this summer. On the prevention side, we were able to add a part-time Lake Host at the State Park thanks to a sizeable donation from one of our members, along with focusing volunteer hours at the Park. The Fundy boat launch is staffed with paid Lake Hosts from Memorial Day through Labor Day and this year we are planning to have a paid host at the State Park Friday, Saturday, and Sunday during that same time. Additional hours before Memorial Day and after Labor Day will need to be staffed by volunteers. Please consider becoming a volunteer in this very important program. Prevention is our best defense against invasive species and is what the Lake Host program is all about. Our first training was held on April 8th but additional trainings will be held as needed to support this program. 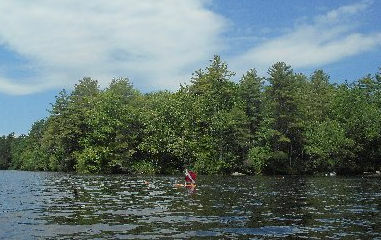 The paid Lake Hosts are funded through a grant from the New Hampshire Lakes Association, a Town Warrant Article and dollars collected from Memberships to the PLIA. If you are unable to volunteer time to this program please consider joining the PLIA or increasing your annual PLIA membership contribution to help support this important program. Remember, your contribution is 100% tax deductible on your 1040A form. In addition to Lake Host volunteers, we are currently seeking Open Water Certified divers to help keep a watch for milfoil. We are also looking into the specialized training necessary for milfoil removal, which requires an Open Water diver Certification as a prerequisite. People interested in taking the NHDES Weed Control Diver course and getting certified should contact Vice-President Tom Duffy at 603 303-3039 or tom.duffy@verani.com. In appreciation for all the help we received throughout the season, we held our first Volunteer Appreciation Picnic in the fall. The board served burgers, hot dogs, and other fare to the folks who contributed their time to help us meet our goals. It is a great group and anyone who would like to join is welcome; send us an email at Info@PawtuckawayLake.com and let us know how you’d like to help. A new page on Lake Levels has been added to this website to address many of the inquiries that people have about that topic. You’ll find it posted on the Home page. We are trying to keep our website content fresh and relevant and will post important information here along with continuing to send out messages through our email list. If you are not getting these and wish to sign up for our email list, send a message with your name and contact information to Pam Kelly at pdkelly@comcast.net. This year we have moved the Annual Meeting to May in hopes of increasing attendance. We have even added a Fun and Games section. Following the business portion of the meeting we will again have breakout discussions, which seem to be pretty popular. As far as business at this year’s Annual Meeting, we have proposed a small change to the Bylaws, to amend the membership year from June 1 – May 31 to January 1 -December 31. It has been noted that the fiscal year membership has been confusing to some members and by changing to the calendar year membership, people will know what year their membership applies to and membership contributions are easily associated with a specific tax year. 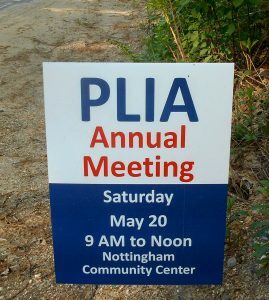 Hope to see you at Annual Meeting on May 20.